We tried to make it out a couple of times this week but the wind and rain just kept a pounding. We will be heading to Friday Harbor this weekend for the Friday Harbor Classic. Hope the weather behaves and we bring in some nice teeners to the scale. Salmon Fishing closes at the end of today – November 30, 2016. Scheduled to reopen January 16 – through April 15, 2017. Twenty-four members fished all over the Bay on Sunday but could only bring one blackmouth to the weigh-in. Windy weather again hampered angler efforts as the winning fish came deep off Fourmile Rock. Large amounts of bait also reported in the same area. Lots of shaker action all morning caused some members to run out of bait. The salmon fishing in area MA 11 is closed until 2/1/17, in area MA 13 there has been a few legal Chinook caught around Fox Island mostly near Pt. Gibson, Green Pt. and the entrance to Wollochett Bay. Trolling flasher and spoons or artificial squid in 120′ to 150′ of water about 10′ off of bottom seems to be most productive. The largest salmon in our monthly derby is 12 pound 2 ounces by Bill Combs. Squid fishing has been good from boats at 90-12 feet in front of the Marina and at the pier on high water and late from afternoon/evening. Bottom fishing for flounder has been good. Crabbing is now closed until we hear if we will have a winter season starting January 1, 2017. For a more up to date report call 253-591-5325. It’s been tough fishing on Lake Washington. The bait and cutthroat trout are few and far between. Late last week I trolled the East Channel with a buddy working both sides of the lake. My friend picked up two smallmouth bass that were suspended in 30 feet of water. Still no trout. Today I trolled the west side of Mercer Island. There was a good bit of chop on the water which in my experience is always a little better for fishing. I trolled the shoreline, under the i90 bridge and around the point only picking up one small cutthroat trout that was hunkered down at the bottom in 30 feet of water. I’m confident it can only get better. If anyone is interested in learning more about kayak fishing, I’ll be at Outdoor Emporium for their “Customer Appreciation Day” this Saturday, December 3rd from 10am until 4pm. I’ll have one of my rigged Hobie kayaks on hand. There will be several other vendors in attendance as well. Outdoor Emporium will be raffling off prizes every 15 minutes and have holiday food and drinks for customers. Stop by and say hello! I would have thought the lake would have been packed on Black Friday but only a handful of people were fishing the bank. I was the only water craft on the lake. I ended up getting 4 strikes and one fish on that I couldn’t get out of the rod holder fast enough. The water temperature is 44 degrees and the fish strikes hard to feel. There are fish in there. I’ve seen them cruising the surface. The lake is full of weeds so fishing off the bank with a bobber or trolling up top is about your only option. Get out there before they are all gone! We are seeing increasing numbers of northern ducks showing as the mallards I saw this past week are with orange feet and much larger in size. As I have said before, the level of the lake is much higher than compared to prior years at the same time. Not much dry dunes showing so plan on hunting from your boat with camo. Still, we have not seen freezing temperatures here but getting over Snoqualmie Pass could be a challenge. We are seeing record rain falls so bring your foul weather gear. 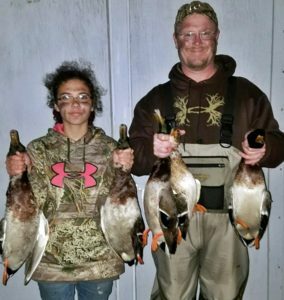 My son was over with my granddaughters and Bridgette got her first greenheads. Those who know my son Matt was blessed with his first daughter, Sydney Ann Pollack. I did not get a single fishing report as hunters dominate the water. Walleye still can be caught mainly fishing jigs. The same thing goes for the bass fishing. Salmon fishing was FAIR this past week. Most of the fish at the marina have been halibut and more people are fishing for halibut than for salmon. As for chinooks, only small winter springs up to 11 lbs were caught this past week. A few fish are now being caught inside the bay. Most of the anglers are now switching over to artificial lures and trolling close to the bottom. Spoons, especially G-Force and Skinny G spoons, in Bon Chovy or Outfitters’ colours have been very effective. Anglers using bait are finding anchovies in glow teaser heads have been working best. For flashers, the Betsey, Lemon Lime and Green/Silver Hot Spot have been good. Halibut fishing has been GOOD and more people are fishing for halibut than for salmon. Halibut fishing was VERY GOOD this past week. Almost all the boats had a couple of fish. The best areas were Race Rocks, William Head, 27 Fathom reef and Constance Bank. Anglers that were fishing were using extra large herring, salmon bellies and/or octopus for bait. Berkley Gulp and Powerbait soft plastics also work very well. You can also use Mudraker, Lucky or 9” Jumbo Squids if you want to stay away from the dogfish. Salmon fishing was BETTER this past week. We heard of a couple of keeper springs up to 11 lbs coming from Coal Island and another one from Hambley Point.. Elsewhere in the Sidney area it was pretty slow except for undersize salmon. Anglers using spoons found Coho Killers, Gibbs Needle G and AP Tackleworks needlefish spoons the most successful spoons this past year. Fishing for salmon was GOOD this past week. The best fishing has been out at Constance Bank where there are some feeder springs up to 10 lbs. However, most of the springs there are around 2 to 4 lbs. We’ve only heard of small springs coming from close in the waterfront. Spoons have been very successful in getting hook ups but you have to check you line every 10 minutes for shakers. Green Spatter Back UV Coho Killers, 3.5” Cop Car spoons or AP Tackleworks needlefish spoons have brought good results at Constance Bank. Halibut fishing was VERY GOOD this past week with the best areas being Constance Bank, Border Bank and the Mud Hole. Marino Piazza caught a 63.3 lb halibut at Constance Bank. We also had a 50 lb halibut weighed in at the store. Anglers that were fishing were using extra large herring, salmon bellies and/or octopus for bait. Also working well, and discouraging to dogfish, was the 9” Jumbo Squid in Green Glow. 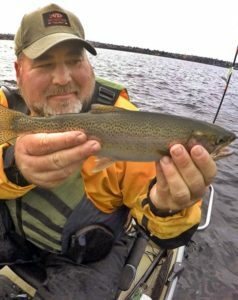 Fishing is GOOD in most lakes for both trout and SLOW for bass. Fishing for salmon in the rivers is now in full swing and anglers are having EXCELLENT results. 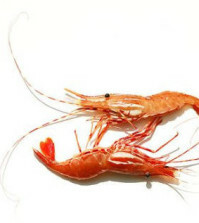 Fishery Notice – Fisheries and Oceans Canada Subject: FN1259-RECREATIONAL – Salmon – Region 1: Vancouver Island River Systems – Chum Daily Limit Change Strong chum returns have been observed in numerous Vancouver Island river systems recently. These large returns will or have surpassed escapement goals. Effective immediately until December 31, 2016 the daily limit of chum is four (4) per day in the open portions of the following Region 1 rivers: Cowichan River: That portion of the Cowichan River from the 66 Mile Trestle downstream to the Highway No. 1 Bridge (Silver Bridge). Nanaimo River: That portion of the Nanaimo River from the upstream side of the Cedar Road Bridge, upstream to the end of Boswell Rd. (commonly known as “Firehall Pool”). Nitinat River: Those portions of the Nitinat River located downstream of Parker Creek and from 50 m upstream to 50 m downstream of the Nitinat River Bridge. Subject: FN1195-RECREATIONAL – Salmon – Region 1 – Cowichan River – Coho Retention Opportunity Effective November 1 until December 31, 2016 the daily limit of coho is one (1) per day (hatchery or wild) in the lower portion of the Cowichan River downstream from Mile 66 Trestle Bridge to the Highway No. 1 Bridge (Silver Bridge). 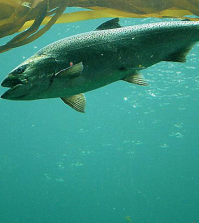 The Oregon Department of Fish and Wildlife (ODFW) reports that Chinook fishing is fair to slow on Tillamook Bay. 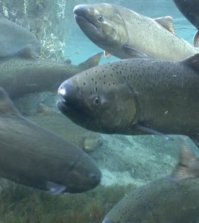 Chinook fishing will probably slow down as the end of the run nears but some Tillamook-area rivers are known to have late Chinook so there are still some possibilities out in the bay. Keep an eye on the weather. There are some large wild coho being caught; remember that coho fisheries are hatchery fish only (adipose fin clipped), and all unclipped coho must be released. Know how to identify coho by the white gum line at the base of the teeth, and the ribbed tail fin rays (Page 95 of the Oregon Sport Fishing Regulations). Don’t assume it’s a Chinook just because it’s large.